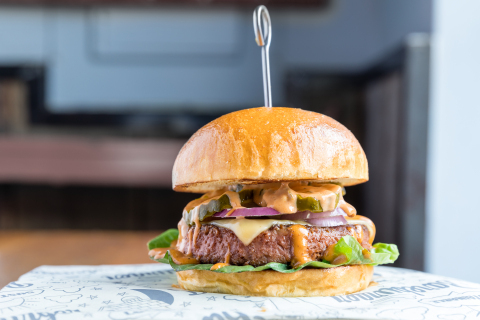 EL SEGUNDO, Calif.--(BUSINESS WIRE)--Beyond Meat®, a leader in plant-based protein, announces today that its revolutionary Beyond Burger is now available on-menu at all 38 Bareburger locations nationwide. The launch highlights Beyond Meat’s rapid growth among mainstream restaurants and partners outside of retail, solidifying The Beyond Burger’s prominence as the nation’s go-to plant-based burger. “Adding The Beyond Burger to Bareburger’s menu answers the rising consumer demand for healthier, plant-based menu options that deliver on taste and satisfaction. Enabling more consumers to Eat What You Love™, our partnership couples the health and environmental benefits of plant-based foods with Bareburger’s commitment to serving sustainable and delicious food options,” said Ethan Brown, Founder and CEO of Beyond Meat. Adding The Beyond Burger to Bareburger’s menu creates even more delicious protein choices for mindful consumers. Last year, there was one plant-based meat option on Bareburger’s menu, but answering consumer’s growing demand, now The Beyond Burger is entering the arena – with less saturated fat and 30 fewer calories, to boot! The Beyond Burger – already available at BurgerFi’s 100 U.S. locations and recently added to the menu of TGI Fridays’ 450+ locations nationwide in the brand’s fastest test-to-table launch ever – is the world’s only burger that looks, cooks and tastes like ground beef from cows but is made entirely from plants, without GMOs, soy or gluten. The Beyond Burger packs more protein and iron than beef but with less saturated and total fat than beef. Since its launch, Beyond Meat has sold more than 11 million Beyond Burgers. Today, it is sold in the meat case at more than 5,000 grocery stores nationwide, including Kroger, Albertsons Companies, Stop & Shop, Shaw’s, Jewel Osco and Whole Foods, as well as on menu at more than 6,000 restaurants, hotels and college campus dining halls. For the latest list of places to find The Beyond Burger, click the where to find button on the Beyond Meat website. Plant-based leader, Beyond Meat, most recently announced the construction of its new Manhattan Beach Project research and innovation facility in Los Angeles. A seven-fold increase of the existing R&D footprint, the new state-of-the-art facility is projected to triple current pilot capabilities and reduce production scale up timelines in as much as half. Bringing together the best and brightest scientists, engineers, food technologists, chefs, and researchers, they work together in service of a single goal: perfectly build a piece of meat directly from plants. Based in Los Angeles, California, Beyond Meat is a privately held company founded in 2009 with a mission of building meat directly from plants. Spanning frozen and fresh, Beyond Meat’s portfolio of cutting-edge plant-based proteins are sold at more than 19,000 retail outlets nationwide. Investors include Bill Gates, actor and activist Leonardo DiCaprio, Twitter co-founders Biz Stone and Evan Williams, Kleiner Perkins, former McDonald's CEO Don Thompson, Honest Tea founder Seth Goldman, Humane Society of the United States, and Tyson Foods. To stay up to date on the latest, visit www.BeyondMeat.com and follow @BeyondMeat, #BeyondBurger and #FutureOfProtein on Facebook, Instagram and Twitter. Bareburger is the leader in America's "better burger" trend, emphasizing high-quality, ethically sourced, organic ingredients in a casual environment. Founded in 2009 in a vacant bakery in Astoria, New York, Bareburger has grown to 44 locations in five countries. Bareburger is ranked among the 10 most sustainable restaurants in America and a "breakout brand" by Restaurant News.